A study by a postgraduate researcher at the University of Southampton has found that Neanderthals were more culturally complex than previously acknowledged. Two cultural traditions existed among Neanderthals living in what is now northern Europe between 115,000 to 35,000 years ago. Dr Karen Ruebens from the Centre for the Archaeology of Human Origins (CAHO) and funded by the Arts and Humanities Research Council (AHRC) examined the design of 1,300 stone tools originating from 80 Neanderthal sites in five European countries; France, Germany, Belgium, Britain and the Netherlands. Dr Ruebens' investigations uncovered new evidence that two separate handaxe traditions or designs existed – one in a region now spanning south-western France and Britain – the other in Germany and further to the East. In addition, she found an area covering modern day Belgium and the Netherlands that demonstrates a transition between the two. 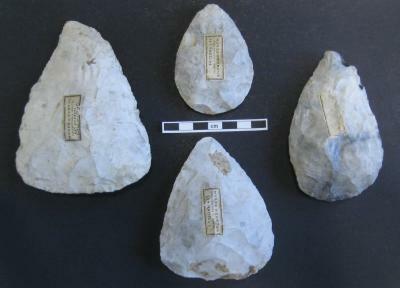 She comments: "In Germany and France there appears to be two separate handaxe traditions, with clear boundaries, indicating completely separate, independent developments. "The transition zone in Belgium and Northern France indicates contact between the different groups of Neanderthals, which is generally difficult to identify but has been much talked about, especially in relation to later contacts with groups of modern humans. This area can be seen as a melting pot of ideas where mobile groups of Neanderthals, both from the eastern and western tradition, would pass by – influencing each other's designs and leaving behind a more varied record of bifacial tools." The University of Southampton research has revealed Neanderthals in the western region made symmetrical, triangular and heart-shaped handaxes, while during the same time period, in the eastern region, they produced asymmetrically shaped bifacial knives. Dr Ruebens says: "Distinct ways of making a handaxe were passed on from generation to generation and for long enough to become visible in the archaeological record. This indicates a strong mechanism of social learning within these two groups and says something about the stability and connectivity of the Neanderthal populations. "Making stone tools was not merely an opportunistic task. A lot of time, effort and tradition were invested and these tools carry a certain amount of socio-cultural information, which does not contribute directly to their function." The study's extensive analysis also shows other factors which could have influenced handaxe design, such as raw material availability to Neanderthals, the function of their sites, or the repeated reuse and sharpening of tools – didn't have an impact in this instance.